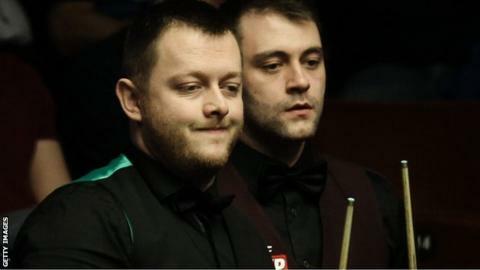 Birmingham's Mitchell Mann will line up in Sheffield this Saturday dreaming of being at The Crucible. This year's World Snooker Championship begins at the famous venue next Saturday (20 April). Meanwhile, a short distance away, the qualifiers are already off and running at Sheffield's English Institute of Sport. And 27-year-old Mann is one of the 128 players needing to win three 19-frame qualifying round matches to earn one of the 16 places reserved in the full 32-man field. Having not hit a ball at a professional tournament since December 2017, including a six-month spell when he did not even touch a cue, Mann is back - recharged, remoulded, with a new back-up team and feeling much, much mentally stronger. "I hated the game," he said. "I hated myself. I didn't want to get out of bed. I didn't want to go out of the house. Everything had hit rock bottom. "I was drinking every day. Awful when I look back now. But, it was only when I realised I had a problem, and could admit it to myself, that I could do something about it. When you're in denial, you're not going to change anything. "It's a horrible feeling. I wouldn't wish it on anyone. But I'm pleased with how I've come out the other side smiling. "The one big thing is my five-year-old daughter Evie Rose. That's what's kept me alive. I've seen how much she loves and needs me. I need to be there for her. "And my mum and dad. I didn't like what I was putting other people through." "I'd just signed for Birmingham City Academy," reveals the boyhood Aston Villa fan. "And I was struck down by a bone disease (Legg-Calve-Perthes disease) which meant I couldn't play any more. "Football was all I'd ever known at that age. All I ever wanted to do. I was crushed by that. I had the surgery done on my hip, but I couldn't do high-impact sport any more. "I was bored at home one night, so my dad took me to the local snooker club. I was on the little pool table, but I noticed the big table through the window and wanted to have a go. I don't remember much about it but Dad said I took to it like a duck to water and cleared the table. "This local guy, John Carter, from Sutton Coldfield, then spotted me, liked what he saw and put in a lot of time coaching me. He's a lot of the reason I've made it as far as I have. Sadly, he's passed on now but I have much to thank him for. "He taught me how to play. I didn't win a frame to start with but, within a month, I was starting to win matches. That's when I knew I wanted to play snooker." "Had it been anywhere other than Sheffield, he'd have won," jokes Mann. "It was a nervy occasion being so young. The crowd were loud as I was playing a legend like Jimmy, one of the game's greats. But what a fantastic guy he was, and still is, by the way. He still gives me the time of day even now. And he still tells me what he did then. Just keep at it." "If it wasn't for what Instarmac have put in over 12 or 13 years, I wouldn't be playing," said Mann. "My dad couldn't keep up with what it was costing. But John noticed me at the club where I started, paid my entry fees and that allowed me to keep me playing." "Suffering with anxiety and depression is a reason I haven't kicked on," confesses Mann. "When my anxiety is settled and I'm feeling relaxed, I don't mind playing in front of anyone. "But it doesn't matter how talented you are, if you don't put the work in and you're playing the best in the world, you're going to get found out. "A lot is confidence in any sport. This is the greatest game to play when you're feeling good. But, if you're not confident, it can eat away at you. "It's how you deal with those negative thoughts. That's what makes a winner. The mental strength. We can all pot balls, we can all play, but there's something that obviously separates certain players. "When you know you've thrown it away, it's important to learn what you did wrong, analyse and try not to make that same mistake." That added half an arena's extra peering eyes, triggering an anxiety attack from which he did not recover, going on to lose heavily. "Individual sports when you're out there on your own are very tough," he admits. "Your thoughts wander. The same thoughts going round in your head. And they tend to be negative. "My situations that didn't help off the table too. Bad habits, bad crowd. Not living like a professional sportsman should live. "A beer at the bar might block it out. But no matter how many pints I drank the problem was still there the next morning. "In the end, with all the people I had around to help me, it was a no brainer what path to go down. I got to the point where I decided I should go to the gym and do something useful. And the feeling I had seeing the weight drop off was unbelievable." "I've had people like that before," said Mann. "But not to the level of expertise Martin has. With the new people I've got, it now gives me a chance. "I'm not the sort to go shouting his mouth off. But I do think I can make a living out of it and it's exciting times. "I'm like a boxer getting back in the ring. No doubt I'll be ring rusty but I'm looking forward to feeling differently in matches. While reluctant to make comparison between himself and world snooker's biggest star, he does admit that witnessing Ronnie O'Sullivan's battle back from the same dark places has helped. "Ronnie's in a league of his own," he said. "He's the Messi or Ronaldo of snooker. Every player admits that. But we're similar in the issues we've had. "There's hope for me from that. He's proved you can come through these hideous issues. He's an inspiration."